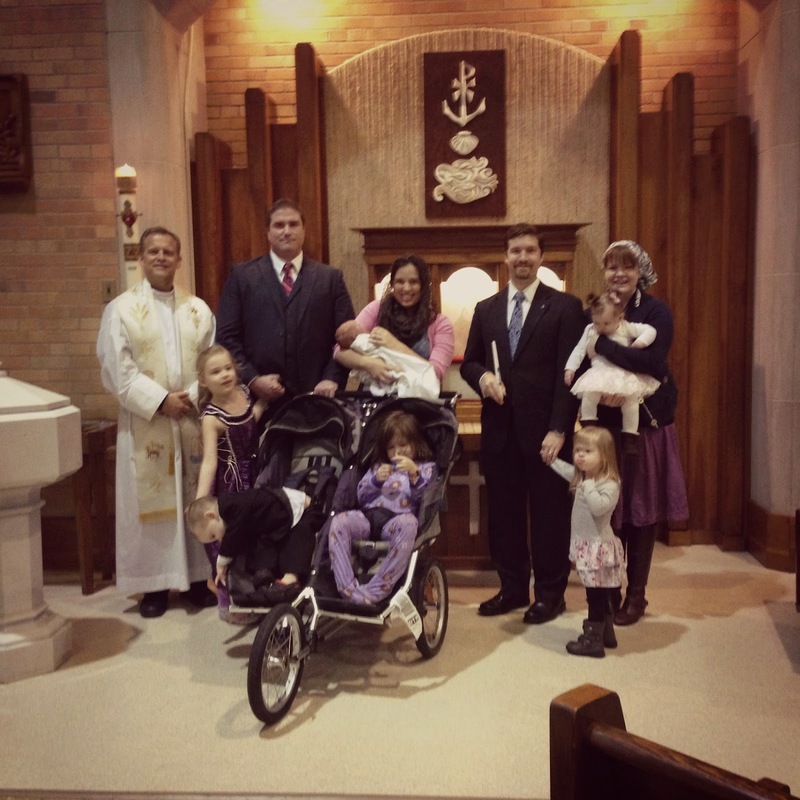 Today, at eight days old, James Ignatius was baptized. I always feel so relieved once a baby has been baptized and today was no exception. 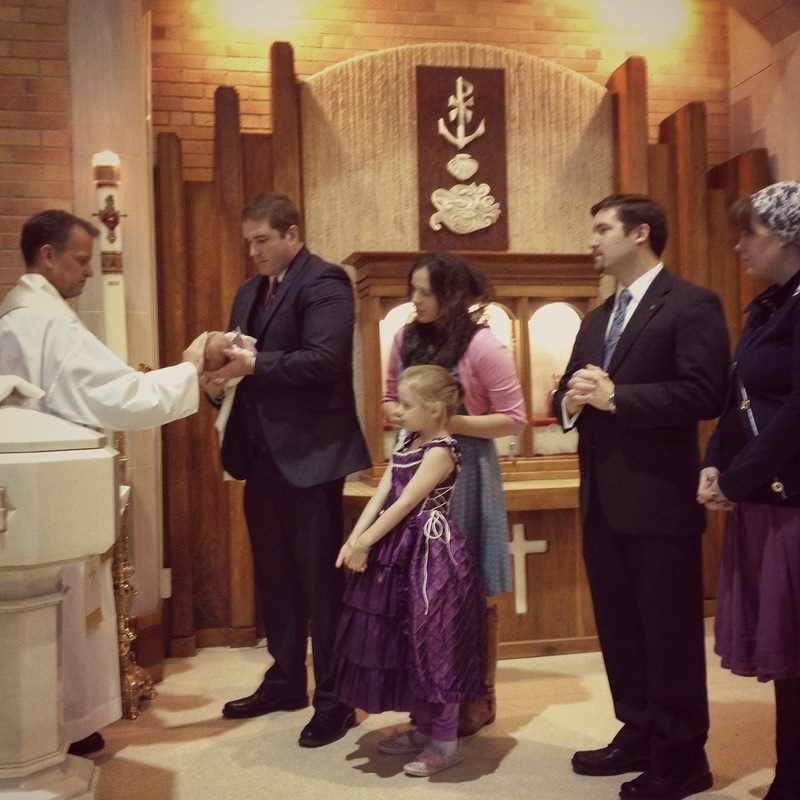 Actually to be honest I get more anxious to have each baby we've added to our family baptized as soon as possible... which means that while I was still in the hospital I was asking Paul to call our priest's secretary and make an appointment. We were also blessed to have amazing Godparents for this little guy. Some of you may know Jacqueline from Journey Narrative (one of my favorite blogs!). We first met Jacqueline and her husband Matt when we lived in Florida and while the hectic schedule of law school has meant that we haven't seen as much of them as we've wanted to since both of our families moved to the same area. They were the first people we thought of when we began talking about Godparents. And it made my entire week when they accepted the responsibility of being James' Godparents (she's even more of a rock star because she had surgery this past week, got out of the hospital yesterday and was still here tonight with her beautiful family!)! James was not the easiest going baby during his baptism. In fact, he cried through almost the entire thing. He paused twice in his wails, once when the water was poured over his head and then again when the chrism oil was applied to his head. Then he went back to letting everyone know that he had a healthy set of lungs and that he wanted to exercise them. Patch was Patch. Have I mentioned that he has a serious case of the "no, no, nos..." these days? He does. Which meant when the priest went through the baptismal vows he enthusiastically shouted his favorite word to every, single question. As in "Do you promise to reject Satan..."
Mae. on the other hand, was so over the moon to actually be inside the main part of the church that she giggled through most of the baptism. It definitely wasn't the quietest event ever held within those four walls. 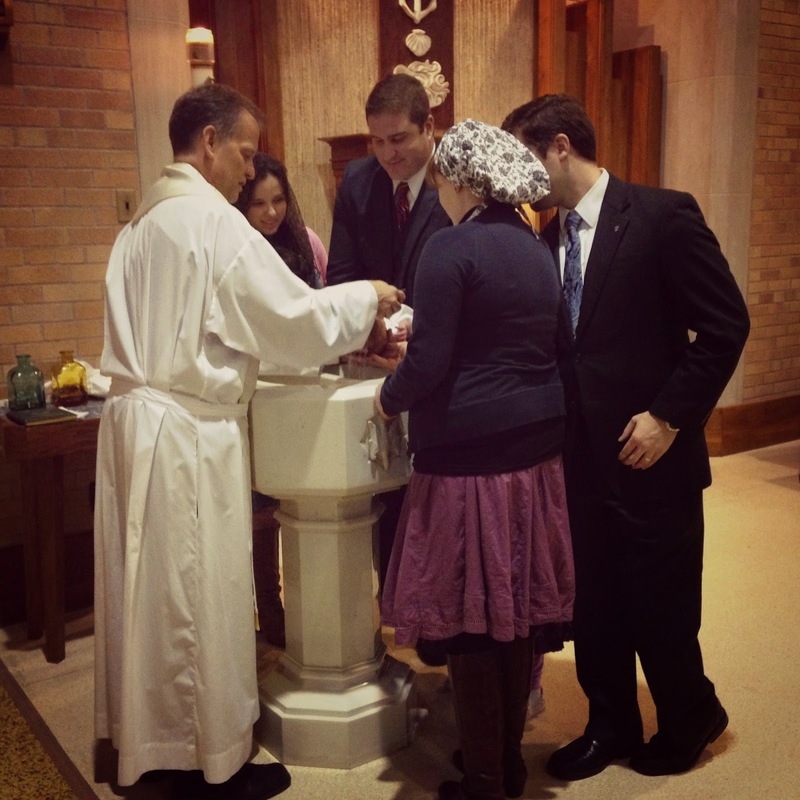 Thankfully our priest is really great and started off by saying that they don't expect baptisms to be quiet! And James' most definitely was not. Now to share some of my favorite pictures from his big day! Now to cuddle with my no-longer-pagan Snuggle Bunny! 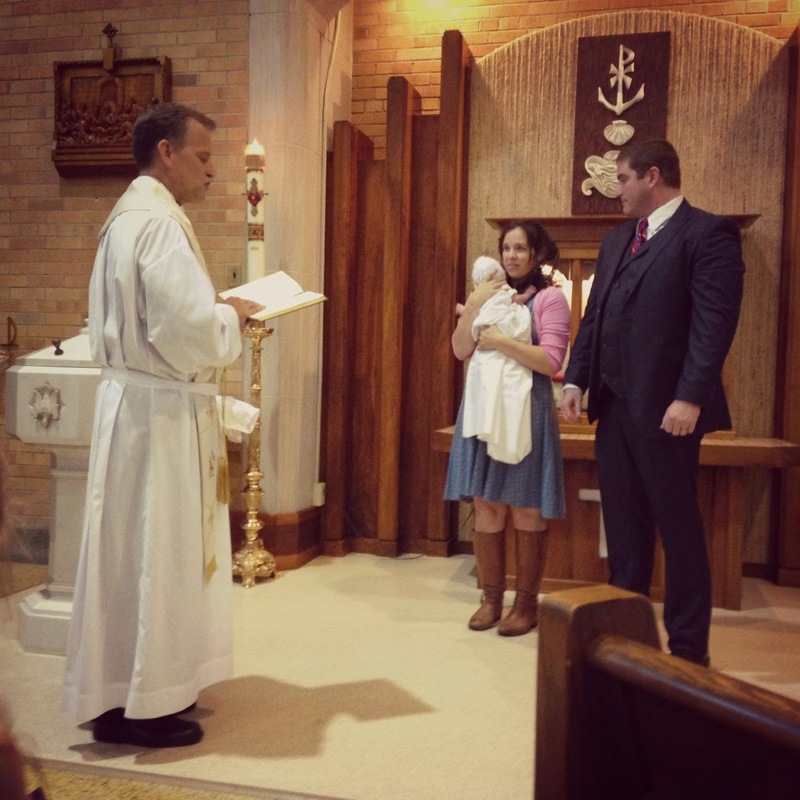 What a nice baptism! You look really good too. You sure are brave for getting out with all your kids so soon after a Cesarean. I did not leave the house for almost 3 weeks! Question - do Catholics believe that babies who die before they are baptized go to Hell or something? Just curious as to why it is a relief to get him baptized so quickly. 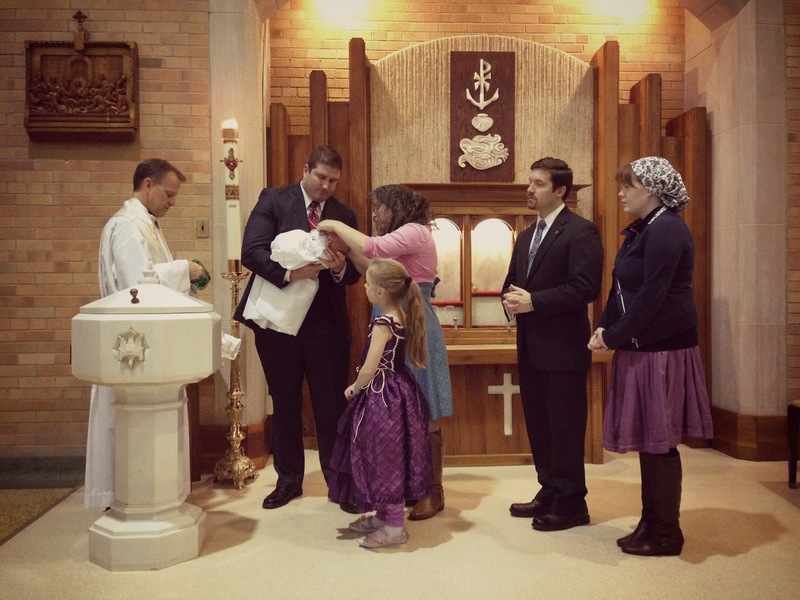 We are Lutherans so we also do infant baptism, but we believe that God is merciful and would not send an infant to Hell just because we hadn't performed the ceremony yet. 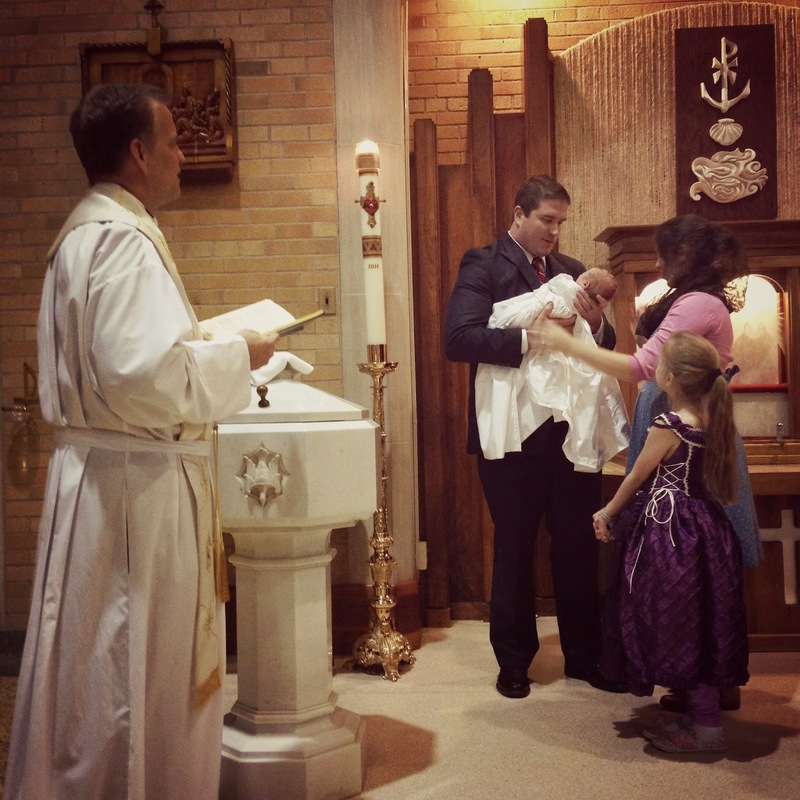 So, although we do baptize babies, we do not feel pressure to get it done asap for fear of our child going to Hell and it is my understanding that limbo is no longer taught in the Catholic church. Thanks for answering! It's kind of complicated and people are divided on it since there's no clear teaching. I tend to believe just as you do, that God's mercy wouldn't allow a tiny baby to go to something like Limbo (even though Limbo isn't supposed to be painful and is supposed to be a natural happy state) and recent Popes who've spoken on the topic have basically said something along the lines of we have reason to hope that children who die without baptism are in heaven, but others use Saint Augustine's arguments about baptism being necessary and still believe in Limbo... So while I do believe infants who die without being baptized go to heaven, I always feel relieved when our little ones are baptized since we don't actually know (if that makes sense).